M. Night Shyamalan's comeback movie to the psychological thriller/suspense/horror scene, "Split" took us to the possibilities, realms, and at some point, the true nature of having split personalities, thanks to the believable and remarkable acting of James McAvoy who played Kevin, a person with multiple personality disorder having 23 personalities living inside of him. The movie "Split" is this generation's modern retelling of "Sybil" story but it has become bigger, bolder, and better. Based on a true story, this film is a better multiple personality disorder movie due to its complications and twists, however, it is not that perfect. At some points in the movie, we have seen some scenes that may not be necessary at all. Some of the in the flashbacks in Casey's story where not utilized much in the main timeline of the film. M. Night Shyamalan could have thought it very well to outsmart Barry, Patricia, or Dennis using Casey's past experiences. The inclusion of Casey's Uncle also did not help in giving solutions to an already complicated situation, where Casey being held abducted to become as one of the food offers in unleashing "The Beast", Kevin's 24th personality to date. Casey's Uncle was just there to make her life miserable. However, M. Night Shyamalan is really good at surprises towards the end of his films, and "Split" does follow the tradition as well. Not to mention his brief cameos in every film that he made, he's like the Easter Egg in every movie that he offers can give a little relief to the more serious main plot of the story. Anyway, "Split" started slow, but the movie gets very exciting and intriguing to watch as James McAvoy just throw out and spit out his acting prowess in every personality. The shifting of characters and the distinction of each personality were really studied well and mastered to its finest acting. We simply love his performance, it can be a contender for an acting performance in the upcoming Oscars, let's just wait and see. We were psyched, thrilled, scared, and amazed by the actors included in the film. Overall, we enjoyed "Split" but we are still looking for some justice as well. We give "Split" a 7/10 movie experience. M. Night Shyamalan's "Split" starring James McAvoy opens on January 18, 2017, nationwide. If you are intrigued, you might as well watch this movie when it comes out! 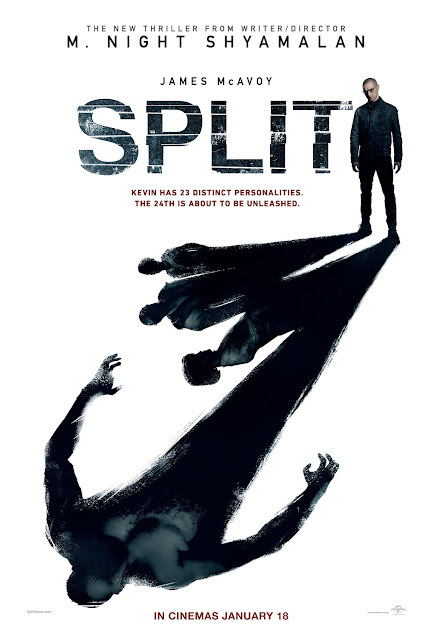 Below is the full movie trailer for "Split".